The Milan Derby was played by opposing two teams in diametrically opposed seasonal historical moments. On one side is Ac Milan, invigorated by the targeted purchases of January, with at the helm a Mr. Gattuso eager to do well and that seems to have found the keystone to support his ideas and to gather a series of useful consecutive results that led him among the first Pos of the ranking. On the other hand, Inter in full crisis, orphaned by the now ex-Captain Icardi, and in clear crisis of identity considering the recent opaque performances, including the release of the scene from the Europa League, against all odds. With these assumptions, the two Milanese were confronted in a race that had all the hint of being the crossroads of the season finale. Milan confronts the race with the planned a 1-4-3-3 with discounted interpreters and, potentially, widely studied by the opposing team. 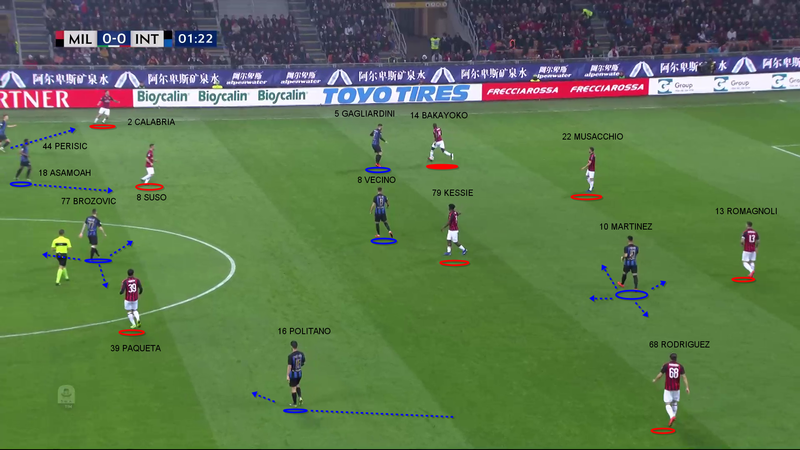 Inter plays on the tactical ductility of the individual elements and Mr. Spalletti launches a very ductile 1-4-3-3 that turns into 1-4-1-4-1 in non-possession but that becomes 1-4-2-3-1 in the offensive phase. In this perspective, two fundamental data to analyse in order to understand overall the performance of the race and the motivations for which a team in the form of Milan has fallen so sharply under the blows of what until a few days ago was a sterile and unarmed Inter. Milan is a team that tends to build from below consolidating the possession of the ball between the first and second third of the field and then develop centrally looking for the tip Piatek match between the lines or the two wings Suso and Calhanoglu on the half positions. On the external courses develop in chain looking for the half-wing in width, usually Paqueta on the left, then work with the wing of part internally and the exterior low in offensive projection. All This obviously assumes that the ball bearer in the first third easily exceeds the first line of opposing pressure. 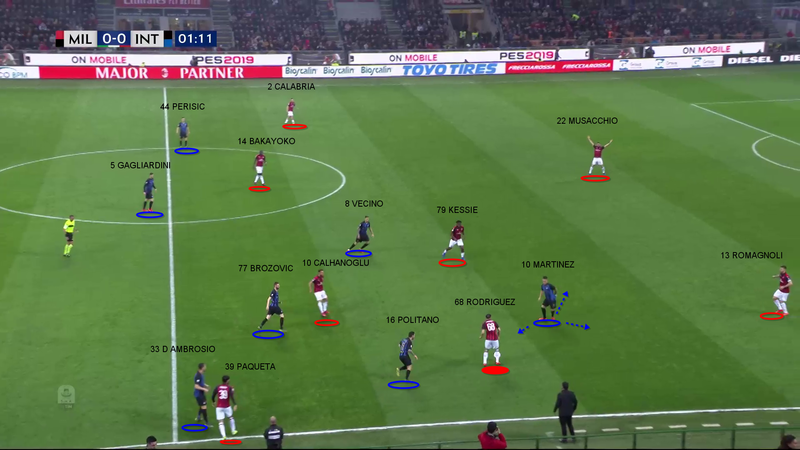 Inter has developed a pressure intensity of 22.2 in the first half and 12.6 in the second attacking always high opponents and never facilitating the development of the maneuver. 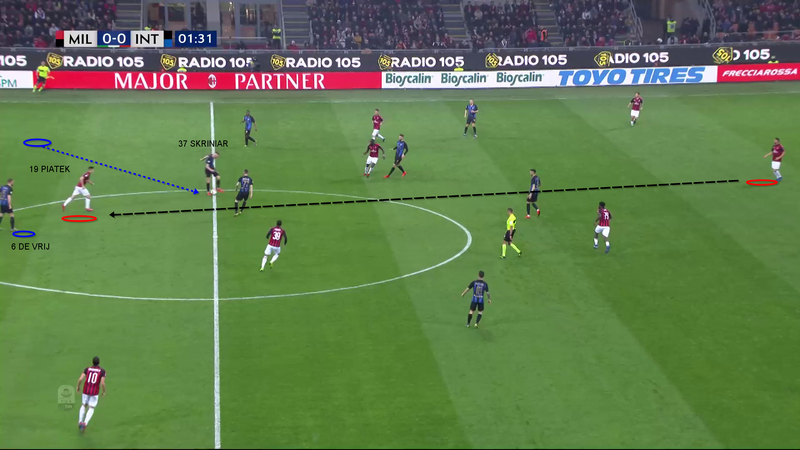 If Milan tried to develop game on the left courses, the ball bearer was attacked from the outside offensive of part (Politano) with the point (Martinez) ready to double or to attack the support. 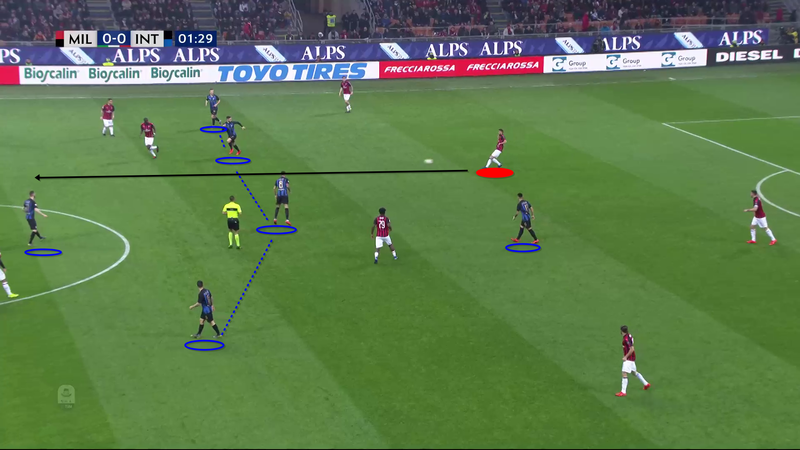 The Milan opened in band the Half-wing (Paqueta) bringing in to the field the wing of part (Calhanoglu), both managed from the outside low of part in ultra-offensive pressure (D'Ambrosio) and from the internal right inter (Brozovic). The low vertex (Kessie) was obscured by the constant pressure of the other internal/blackblue (Vecino). The remaining midfielder (Gagliardini) was predisposing in preventive marking on the direct opponent in the area (Bakayoko) and the external offensive opposite (perisic) clutched the field ready to go out on the outside right-hand side (Calabria) on a rapid ball Opponent. A very similar situation was created on a possible ball on the opposite side with all the elements, supports and supports, previously controlled by men in the area, always on lines of advance to never submissive compared to the opponent. This attitude forced the Milanese rearguard to necessarily force the vertical play to try to overcome the first pressure. In These cases the Rossoneri seek the entry between the lines for the meeting movement of the Central tip (Piatek). 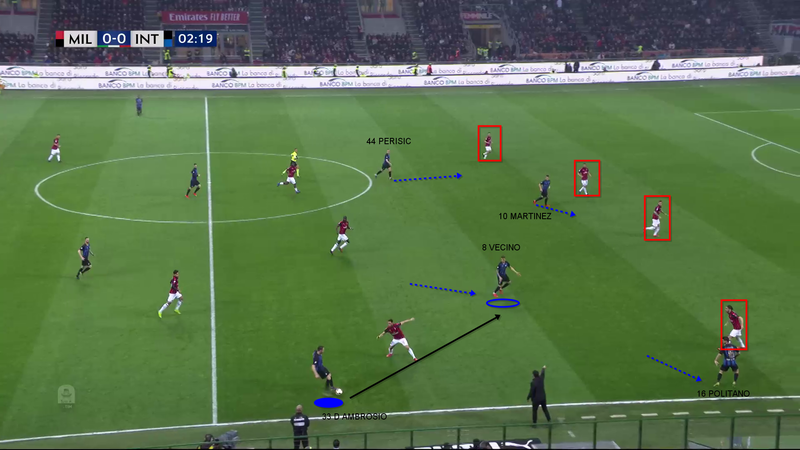 This solution, too, had been amply stemed from the prudent tactical trim of Spalletti with the two defensive power stations (Skriniar – De Vrij) which, depending on the area of action of the Polish striker, worked in advance and cover. In the second half, widely delayed since the tactical chess board was already clear after only 3 minutes of the race, Gattuso rewrote the deployment of his inserting Samu Castillejo and moving to 1-4-2-3-1, quickly stemed from the Shoulders with the lowering Further of the low summit of the midfield (Brozovic) to manage the opponent in the area, without more working in cover with the two halfwings. Inter has developed a large amount of offensive play with 43 shares of which 12 (28%) Reached the conclusion, while the Milan 40 developments of which 8 at the conclusion (20%). Already These data give the idea of a lesser offensive efficiency of the rossoneri that given the particular aggressiveness of D'ambrosio under pressure have oriented the game offensive to 27% on the right lane and 69% in the central area of the field. Both in optics (Suso) and centring (Piatek) streams, the Rossoneri were rather predictable in the choices and never particularly fanciful. On the other hand, Inter has shown just after a few minutes to have understood the difficulty of Milan in the management of half-spaces and want to turn it in his favor. Offensively the Nerazzurri have proposed a 1-4-2-3-1 that saw the offensive wide and ready to move close to the inner area of the field, a central mobile tip is meeting the midfielders who attack the depth and a midfielder Incursor (Vecino) to stationing the Trocar acting as a finisher but also by striker added on side ball. 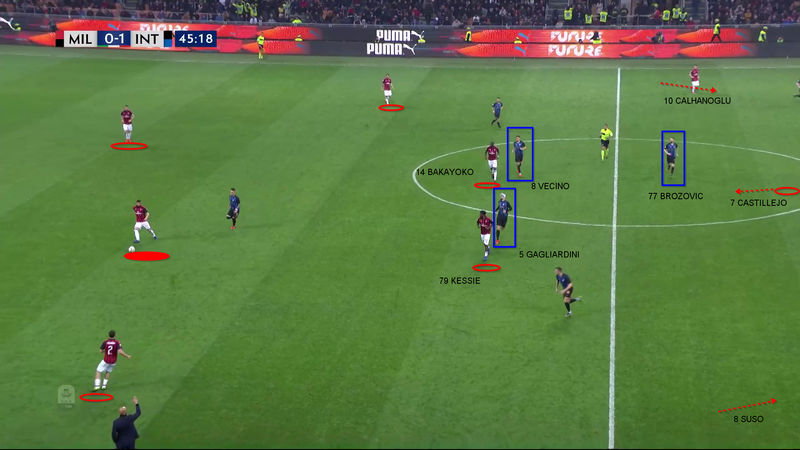 After just 2 minutes of play Inter builds from the bottom in 4 + 2 with the connected backs occupying all the width of the field, stationed in the finishing area with Vecino and having the possibility to play deep on the Punta Martinez. From a quick exchange out-inside and the triggering of what was dynamically a Vecino Halfapunta was born the action of the first network of the race that brought inevitable pressure on opponents. From the same intermediate spaces exploited by Inter and never dammed by Milan even with the two medians was born also the action at 65 of the second half that led to the incursion of Politano and the penalty granted and transformed by the Nerazzurri who, despite a final forcing Of the Rossoneri after the momentary 2-3, has in fact closed the race. This entry was posted in Match Analysis and tagged derbydimilano, gattuso, spalletti. Bookmark the permalink.